There is a certain rush that we as teachers feel as the school year draws near the end. Will we have enough time to get to everything? How do we keep these kids in line? Have we done enough? When does summer begin ☺? There is also the pressure of looking forward to next year. Are you shifting grade levels? Adopting new curriculum? Jumping into a pilot? Focusing on proficiency based feedback? Or asking how am I going to keep my head above water? Take a step back. Take a breath….and let’s talk. 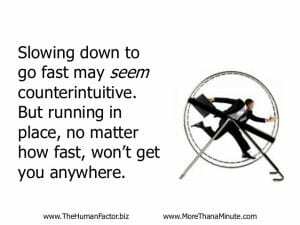 In order to gain some control and confidence as you move forward, it may benefit you to slow down. Slow down and know that you have support to help you develop a system that allows for a deeper understanding of your standards. This year I have had the privilege of working with a few teams of teachers to help create a system that allows them to dig deep into their standards and find ways to identify what proficiency means. We have worked together to identify reporting standards and move those into rubrics or proficiency scales that use language and student examples to clarify what proficiency looks like, sounds like, and can be described as. These documents are not created to be kept hidden in our ever growing Google Drive. These are living documents that are evaluated weekly and tweaked to help create clarity amongst a team of individuals that are all teaching students in the same grade span. When thinking about the best way to write about this process I realized that I did not have the best version of the process to tell. I decided it would be best to reach out to those that have gone through the experience this year and have them share how this process has helped them gain clarity and a solid foundation to move at a quicker pace moving forward. When approached with the opportunity of norming in the fall, much like many teachers, my immediate thought was … and when do I have time for this? Up until that point, and even still afterwards, the feeling of not having enough time is always a pressing issue for teachers and there never seems to be enough of it. Being as transparent as possible, the issue of time will always be there, HOWEVER the efficiency and productiveness of time can change and norming has demonstrated that. As a classroom teacher that specifically focuses on the STEM side of the grade level content, I felt like I had a pretty solid handle of the standards that my kids were being asked to master. Fractions, got it!, Multiplication and Division, you bet! Decimals, piece of cake! As a grade level, we were trying new strategies and structures to meet the individual needs of the kids. Again, as transparent as possible, the new math continuum was a bit overwhelming as it was uncharted territory for not only students but also for us as teachers. Recognizing the nature of the continuum and the proficiency component that is embedded within it, the proposition of norming fell smack dab on our laps at the perfect time. Fast forward to this spring, we are now fully entrenched in the norming and proficiency process. At this point, we have met as a collective team to create proficiency rubrics for three days and meet weekly to norm our student samples. We are far more reflective in our marking of students and their progress as we have established consistency and actual parameters of what it means to be proficient. We have edited our completed rubrics again and again and again as we have realized over time how to make them better. YES, a lot of time as been put into this adventure however that time has also been invaluable! As a team, our constructive conversations have led to clarity, consistency and a thorough understanding and unpacking of the standards. While the norming process has bitten off a big chunk of our time this year, the transition back into school and math next year will be a lot friendlier based off the work and conversations that we have had this year. We thought we were taking a few steps backward while in reality, we were jumping many steps forward! The time that we have spent has truly been worthwhile as the work produced was lasting work that made a difference not only in student achievement but also teacher performance! Believe it or not, math is not as black and white as we all think it is. There are an abundance of resources and activities that address each standard we teach. Unfortunately, not all of these resources and activities are consistent with what the standard actually means. Some go beyond while others just skim the surface of what is truly expected. Just like these inconsistencies in the resources and activities, within our team there were differences in interpretations of what it looked like to be proficient in the standards we were teaching. Even though each one of us knows the standards, the level of expectation differed from classroom to classroom. This sparked and ignited a discussion with Lauren. Our team decided it was time to meet and create proficiency based rubrics for essential standards within the current domain we were teaching. Yep, another task we added to our plates but in the end so worth it. Our first meeting was an all day affair. We spent pretty much all morning discussing our goals for our meeting and establishing norms. In addition, we examined the standards we were going to identify as “power standards.” Just these two agenda items took time to discuss but they were an integral component for our afternoon task of creating rubrics. The in-depth discussion that took place was valuable, but it was difficult especially if we were not on the same page as far as proficiency. It is important to be open to others’ ideas and opinions. This discussion took a lot of collaboration as well as compromising. Making time to meet, the quick turnaround on providing student samples and using the rubric to norm and then time to discuss the samples we were not on the same page on was a very slow process in the beginning. It takes commitment from all team members involved. By taking the initiative to begin this process and creating norming rubrics as well as providing student samples to look at and discuss, helped our team align our expectations on proficiency. I am not going to lie and say it was easy at first. Now it is just part of our routine. Norming student work as an individual teacher and comparing our rating with our peers, forced us to step outside of our comfort zone. Flexibility and being open to a living rubric are crucial components to this process. The definition of proficient may change as students display their knowledge. Therefore, there may be a need to tweak the language. In the long run these difficult conversations have brought us closer as a team and the level of collective efficacy has strengthened. We are still working through kinks and tweaking but I feel the time we have put into this process has made us more cognitive of the feedback and activities we provide for our students. Our worthwhile discussions promoted a deeper understanding of the standards as well as what we expect students to know in order to show proficiency. Isn’t this worth the time? We were fortunate to be an integral part of the utilizing the math continuum this year. While we started with a proficiency based checklist to monitor student’s achievement, we were finding that it was very cumbersome and pointed out a glaring problem that we weren’t all on the same page when it came to what was proficient. This isn’t to say we didn’t know our standards or what we were supposed to be teaching, just what I thought was mastery level work wasn’t the same as my colleagues, which was surprising because we have taught together for years. There is where the problem lies. We assume we all hold our students to the same level of expectations. Did it mean that one of us is a better teacher than the other? Absolutely not! All it did was provide us an opportunity to become a stronger team of teachers that will do better for students. We needed a better tool to report; that’s where it all started. How do we create a more useful tool that is less time consuming but would give us a better picture? Rubrics and norming. I would be lying if I said this wasn’t a time consuming process, but I would also be lying if I said this wasn’t the MOST worthwhile PD I have done as an educator. The process wasn’t pretty… we debated… A LOT, we were frustrated, we comprised, but our team left stronger, smarter, and with a clear picture of what proficiency looks like for our students. This led us to weekly norming meetings where we pulled student samples and evaluated each piece using the created rubrics. Initially, the meetings took some time because we again debated on the scores that we all didn’t agree on, but now there are weeks we don’t meet because our scores are all in sync. We have become an well-oiled machine. Student voice and choice is at the core of personalized learning. This is an area where we have all shown growth over the past few years. At times, we struggle with balancing voice and choice with how or what we present to our students. Teachers like to craft lessons, it is part of how we were trained! However, we must adapt and change to meet our learners and how they respond. This same concept applies to how professional development or opportunities for teachers must evolve as well. A few months ago, Natalie and I presented the opportunity for a Twitter Chat among our four buildings during morning collaboration time. This opportunity was truly inquiry based with the goal of us exploring together. We hoped it would bridge communication among buildings as we all strive to learn about personalized learning. We were thrilled with the initial response of over 30 participants. We asked for your ideas of topics, what schedule would work best for you, and offered twitter support. While we gave you a voice in how we developed the Twitter Chats, our participation has dwindled. Although we personally may love Twitter Chats, it is clear to us that this format isn’t working for everyone. It seems clear that there is a desire to connect and learn about what is happening in other buildings, so we are faced with deciding what the next steps are in determining a new format. We want this collaborative opportunity to be one that is valuable for you, so we are once again asking for your voice. Just as teachers and students can co-create a path to learning, coaches and teachers can do the same. Please take a few minutes to fill out the survey in this link, so that we can alter our path in a way that is meaningful for all of you. Please fill it out by next Thursday, April 18th. We will reach out soon with new opportunities. As we are now in the midst of having our students publish a piece of narrative writing to collect district data; the students are given the option to either revise their submission from the beginning of the school year or to create a new piece. An important part of the writing process is revision. But exactly what is revision? “Revision is the stage in the writing process where the author reviews, alters, and amends their message, according to what has been written in the draft. Revision follows drafting and precedes editing. Drafting and revising often form a loop as a work moves back and forth between the two stages.” See below. Revision is not easy. Our writers need to be explicitly taught strategies on how and what it looks like. We cannot just tell our students — go revise your paper, they will be lost. Below are some strategies on how we can get our students to revise. Provide models for the students to see what this looks like. Take a piece of writing from your own journal and model in front of them what it looks like to revise. Example: My pickup truck made its way down the road to school. Revised: My old, tattered, and rusty pickup truck made its way, chugging along, down the road to school. Do you have a better understanding of the subject? Can you picture this in your mind? Did you stay on the subject/topic throughout? Revision can be taught during small group or individual conferences, depending upon the need of each student. 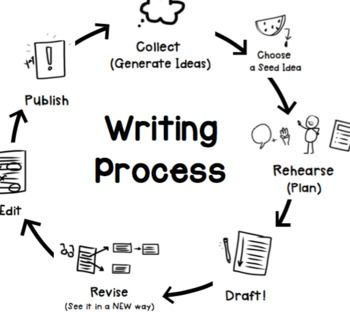 If you are wondering what this might look at your grade level, below I have included a Learning Progression for the Writing Process on revision. With support, writers can go back and tell new details about the event/topic. They can point to their pictures, add on to the pictures, and perhaps label. When nudged, writers reread their work, and revise by adding to pictures, making new pictures and sentences and adding labels. When nudged, writers revise their work by “stretching” out a picture, that is, drawing more pictures to show parts of the event and then writing sentences to stretch out the story. The writer may also add more sentences (between three and six sentences to the book). A writer at this stage is also starting to learn that revision can help focus a piece of writing and may begin to take off parts. A writer at this stage has a small repertoire of revision strategies (add more dialogue, take away parts, add more details, stretch out the most important, etc.). She knows to use a chart for visual reminders of learned strategies. A writer at this stage knows that there are predictable places that are important to revise (e.g., the beginning, the climax, etc.). The writer begins to revise with more purpose, considering craft and the effect different craft choices have on the way a story sounds to a reader. A student at this level will write an entirely new draft of a story. In previous levels, the child may have written changes on an original draft and published that, and now she is ready to make significant large-scale changes and then write a second draft outside of the notebook. She has a small repertoire of revision strategies and knows that there are key ways revision can always pay off (i.e., revising beginning, ending, key parts, rethinking audience, topic, etc.). Her new draft does not just feel like a reworked version of the first but rather shows significant large-scale change. She knows to begin working on a new piece immediately after “finishing” one. The student at this level can take one piece through a sequence of drafts, each feeling entirely new and benefiting from large-scale changes. Students at this level have multiple revision strategies, They “write until the water runs clear” and know that more rewriting will lead to better writing. The child also understands that revisions bring out the significance of the piece. The writer is starting to not wait until revision to make a piece stronger but considers this while drafting. At this level, students have an internalized sense that yesterday’s revision strategies become today’s drafting work, and they bring all they know about revision into the initial drafting of their stories. Their revision is large scale and targeted, and they have multiple strategies to draw from. Students at this level begin to look closely and critically at mentor texts during this stage of revision and ask themselves what the author did that they can try. At this level, students revise not only drafts but also entries, choosing to find ways to ratchet up their own work using strategies they have learned, mentor texts, and talks with partners. Rather than following strategies to revise key places, a student at this level might instead or also read through a piece searching for places where the writing feels stronger or weaker and marking and rewriting those over and over. A student at this level might also start to revise by experimenting with craft to bring out significance. For example, a writer might not just rewrite her lead starting with dialogue, description and so on but rather look more closely at varying sentence lengths, word choice, punctuation moves, and so on. As always, let us know if we can help you further. Calkins, Lucy. Units of Study in Opinion, Information, and Narrative Writing. Heinemann, 2013. Linder, Rozlyn. The Big Book of Details: 46 Moves for Teaching Writers to Elaborate. Heinemann, 2016. This blog post is dedicated to a colleague and a dear friend. Lorrie, you will be missed and many of these thoughts and ideas came from the many fun times that we shared. Heaven awaits a very special person. Rest in peace my good friend! It’s almost here! We have persevered through three months of winter. We have dealt with the treacherous weather conditions, the task of fighting off the many classroom illnesses, the turmoil of state testing, a recent tragedy, and the everyday grind in the occupation of teaching. Spring Break is finally upon us! Plan Nothing- Imagine a day without anything to do. A day without meetings to attend or appointments to be made. A day without anything is a day of relaxation. A day spent in your pajamas. Don’t Set Any Alarms- Oh the joys of a 9- day weekend. Bring back the days of college- rise and shine at the crack of noon? How fun it is to wake up when you want? No need to worry about your snooze button. Read a (Whole) Book- How many times have you picked up a book to read, only to find out something else comes up? Dig deep into that book that you’ve been putting off for a while. Indulge yourself with some uninterrupted reading. A nice cup of coffee or another favorite beverage will make it so worth the while! Blast Your Music & Dance!- If there ever was a time to let loose, do it now. If the weather allows, open those windows and crank those tunes- let it all out! I’m thinking Tom Cruise in Risky Business! Road Trip!- Take one, or several, quick two-three day road trips- take in some sights in the Heartland of America or venture out to our neighbors to the north or south. Spending a couple days away does wonders for the soul! Don’t forget the SELFIE at each state’s Welcome sign! Buy Something for your Other Rooms- So many times we’re buying things for our classrooms. It’s time to splurge on your own house. Walk around your house and focus on your own flexible seating! Find a relaxing project that takes care of your own needs. Catch up on Life!- We all have things that we put off- now is a great time to get caught up. Whether it’s emailing a friend, adding to a scrapbook page, or finishing up some tax filing, get it done, then get back to relaxing! Indulge in March Madness- Is there a better time to follow the NCAA tournament than during Spring Break? 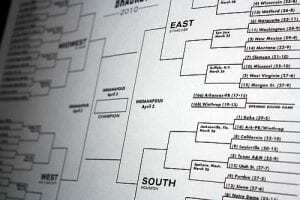 Cheer on your favorite team (probably not a local one) or just track your brackets. If you’re lucky enough, head out to a host site and catch some action! Get Back into the Exercise Room- If there is ever a time to get yourself back into a routine, it is now! This is a great time to blow off some steam and get yourself ready for the summer! Get that schedule started now- it’s easier to get started when you have nothing else planned! It’s Opening Day- Take Me Out to the Ballgame- enjoy the start of the baseball season! Spring training games are wrapping up and the regular season official start is March 28. Make an attempt at one of those road trips and catch the action live. There’s also a good chance our high school and college teams are hitting the fields. Throw a Dinner Party- What a great way to catch up with friends and neighbors! Give it a Spring Break kind of theme while you’re at it. Fire up that grill and take it outside if the weather permits. If the weather doesn’t cooperate, make the most of a night to enjoy with friends. Pamper Yourself- Get that relaxing massage you’ve been putting off. If you need your nails done, what better time? Maybe you can even soak up some sun! For those golfers out there, what’s more relaxing than time on the range? Binge Watch- All those Netflix shows you’ve been putting off, this is the perfect opportunity! Coach’s tip: Need some humor? Search Netflix for The Ranch. If you’re a fan of The Office, this is the ideal binge for you! I’ve also heard that Jack Ryan is a big hit! Stay Up Late- Remember those days? Who needs a bedtime during Spring Break? If you’re sleeping in, why bother watching a clock? Great way to make the most out of binge watching as well. Get out and Enjoy the Weather- I am so hopeful that this is possible (fingers crossed)! 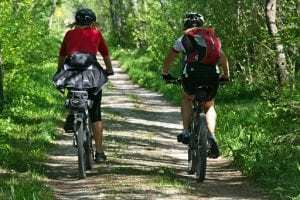 Take a ride on your bike or a stroll through the neighborhood. Get out those shorts and flip-flops. Enjoy your morning coffee out on the deck and just listen to the sounds of Spring in the air! Call your BFF and Just Chat- When was the last time you actually had this opportunity? Your teaching BFF does not count– this needs to be that friend or sibling that you just haven’t had the opportunity to chat with. Reach out and indulge yourself in the conversation. Start Planning Summer Vacation- What better time to start? Get a game plan going- plan out each week so you’re not wasting away precious time during the summer. Finally, RELAX!– Enjoy your time away by just going about your day like you just don’t care. Get yourself healthy- get those doctor visits out of the way. Dedicate your break to taking care of yourself and rejuvenating for the final two months of the school year. Have a safe and refreshing Spring Break! In a time of constant change, it seems as if we can never really keep up. As we rush to keep up, the haste to move forward can create systems that haven’t had the opportunity to solidify a foundation. In a time where things are so hurried, it might be time to think about slowing down. 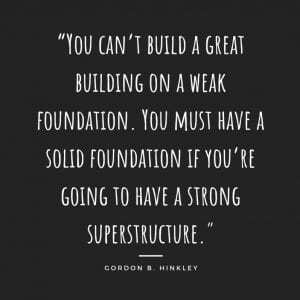 Slow down and build your solid foundation. Slow down to get procedures in place in your classroom. Slow down to deepen your understanding of your learning targets and create clarity in what it means to be proficient in your standards. This slow down will pay back in dividends. Because by now we all know I struggle with brevity, this will be another two part blog post. I decided to first address what you could reflect on in your classroom today; focusing on procedures, structures, and planning. Next month, I will follow up and offer some ideas and suggestions about ways to deepen your understanding of your learning targets and creating clarity on proficiency. Personalized learning often gives us the feeling that we need to hand over the reins to the students and let them experiment and create for themselves. Personalization feels like it should be a free flow of ideas based off of what the student wants and needs, which means it would be near impossible to plan or create structures for all the students we see each day. Yet, as we start exploring personalized learning with students, I believe we are starting to understand how incredibly vital good procedures, structures, and planning are in order to create an environment that allows students to personalize their learning. Procedures are the routines in the classroom and structures are the organizational elements that need to be understood for there to be a safe and productive environment. These guiding elements give students stability and create a room where learning can be varied and yet still organized. Procedures and structures are often times focused on at the start of the year, but begin to slip as the year goes on. Have you re-calibrated your classroom lately? Kaneland adopted the CHAMPS model to assist in creating a common language about behaviors and expectations for procedures and structures. Did you take the time to train your students on all elements in CHAMPS? When was the last time you revisited the expectations for behaviors or procedures? Does it seem to take forever to get students to truly understand and follow through on the expectations? Go slow. Make sure students have full understanding. By taking the time to solidify procedures and structures, less time will be lost at the end of the day when students are moving independently. 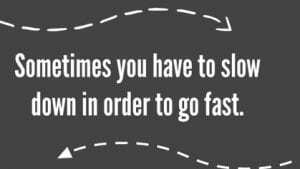 It is one of those situations in the classroom where you need to go slow to go fast. How to request Help from the teacher or a peer? What a student can/should do while waiting for help? Expectations of an Activity? How to move through the task? Where the materials are to complete the activity? Where to find a new activity or where to turn in something that has been completed? Movement in the classroom? When should they be moving around? When they should select traditional seating versus when alternate seating? What appropriate Participation looks and sounds like? Do they know how to conference with peers? Do they know when it is best to work with a partner or group or when it is best to work independently? The rules and expectations of your room? Planning is a structure that helps teachers and students gain clarity before a unit begins. As a new teacher, you were trained on how to create a traditional lesson plan. You knew your objectives, activities, resources, and ways that you were going to differentiate for a variety of learners. How many of you still use this form? I know at the start of my career I was intentional about my planning. I used that form. My planning began to shift in year two when I purchased the traditional lesson planning book and just jotted down my activities for the unit. By year five, I was sometimes using my planner and other times would go back afterwards and plug in what we did. As I gained experience I relied a lot less on that planning book. Personalized learning is a new way of doing things for those that are first year teachers, as well as veteran teachers. We are shifting our standards into “I can” statements to create learning targets that are student friendly. Do you have lesson plans with these on them? Do you have a map of how your learning targets build together versus live in isolation of one another? When you do a culminating activity or project do you and your students fully understand all the targets that were building blocks? 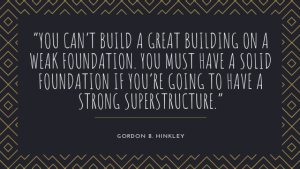 What foundational skills do students need to be successful at the end? 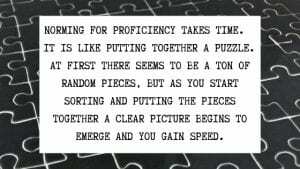 What are a few different options for students to display what proficiency looks like? Backtrack and scaffold foundational targets. What information/skills will be new to all of your students? These ideas/concepts/knowledge often times require a full group instruction, often times referred to as legacy or seminar instruction in personalization. What information/skills will lend themselves to small group instruction? What targeted instruction will you provide? How are you differentiating for a variety of learners and coaching students? What new information/skills can be built as a student team without much teacher assistance? Where will you strategically use flex grouping to allow students to have academic discourse? How will you allow students the ability to personalize as they are gaining these foundational targets? 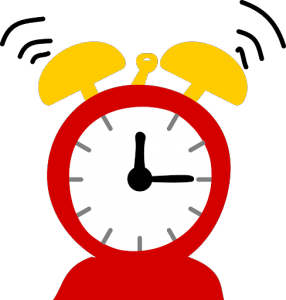 Do you have formative check in points scheduled? Do your formative assessments focus on knowledge and skills? What materials will you have available to students? Do you have a variety of resources (print, online, community, etc)? Allot time for student planning and reflecting. When will students be able to set goals or create learning plans? How will students learn about the learning targets and see models of what it is like to hit the learning target? Where is reflection imbedded in the daily routine? Plan for a variety of student ability and rate of completion. What are some ways you could modify for those struggling? What can be done for those that move quickly to proficiency? Please remember that personalized learning doesn’t say that you should not help students make academic decisions. 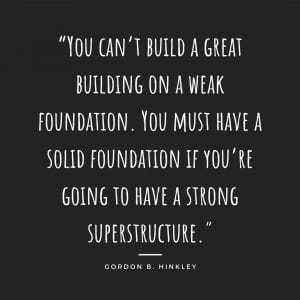 Students need structures, guidance, options, and coaching in order to help them grow as learners. Personalized learning allows students to have a voice and choice in how and what they are learning as they become co-creators in their education. A teacher needs to have the ability to give students clear examples of proficiency, suggest appropriate activities and resources for learning, and a way to provide formative feedback to learners. Personalized learning is not about setting students free to fend for themselves. Thoughtful and thorough planning is crucial for teachers offering personalized learning experiences. We have had a lot of discussion around our School Improvement Goals in the past few weeks. I thought it might be worth taking some time to reflect on our focus and the benefits it can bring to students. I looked back to our district constellation that we explored at the Personalized Learning 2.0 Academy earlier this year. The honeycomb cells identified are terms that we know and understand, but what does the research say? I have been contemplating aligning Hattie’s research on Visible Learning for the past few months. I wasn’t sure quite how to approach that. By refocusing on our constellation, it seemed appropriate to explore what the research says about each honeycomb. Keep in mind that the effect size of .40 signifies one year of growth. What I have listed below are only some of the effect sizes that could be categorized in each area, but I selected the ones that seemed most meaningful. I think if we truly reflect on what we have implemented and what our next steps are, we will further ourselves in personalizing for our students. If you are curious to read the definitions of each honeycomb cell, you can access a pdf version of the image below here. Last week’s coaching blog entry focused on Reading Conferences. The resource shared seemed to be an excellent tool to use for implementing conferences in any area. Conferring is a key component to Proficiency Based Progress, but teachers and students can also integrate the topic of a student’s Learner Profile as you explore together student progress, sucesses and frustrations. 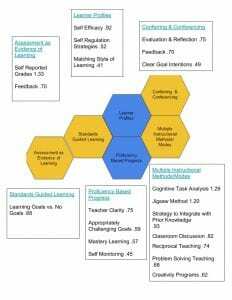 As we gain further understanding about Personalized Learning, we will hopefully see the blurred lines among these honeycombs and experience a classroom that truly empowers students. Is it time to create or update your own constellation? I would like to close with celebrating all of the wonderful implementation that I have witnessed across our district. As we collaborate within and beyond our district about personalized learning, my takeaway is always that Kaneland and Kaneland teachers and students are doing great things. The choice and voice that I have witnessed here is impressive. Let’s keep the momentum going! I can say without hesitation that I am proud to be a Knight! Weichel, M., McCann, B., & Williams, T. (2018). When they already know it: How to extend and personalize student learning in a PLC at work. Solution Tree Press. Now that you know what a conference is, the next step is to contemplate which kind of reading conference would be beneficial to your students. Serravallo summarizes the different types of conferences, linked here, that could be structured in to your reading block. Next, you are thinking what are the rest of my students doing when I am conferring with students? What makes our students better readers is the time to read. Research tells us that reading related activities such as comprehension question worksheets, phonics activities, memorizing sight words take up way too much time during the reading block. Instead the students should be reading for sustained periods of time. 10+ minutes: twice weekly, subtract some time from independent reading to allow for partnership or club time and conferring. This book is full of so many great tips and would be a great addition to your professional library. Let us know if the coaches can assist you in any way with your reading conferences. Serravallo, Jennifer. A Teacher’s Guide to Reading Conferences: Grades K-8. Heinemann, 2019. Writing a blog at times can become a difficult thing. When you come up with a topic, you’re not always going to say the right thing and there are certainly people that are going to disagree with everything you say, or just have no interest. It is sometimes a risk that you take when choosing a topic- sometimes it comes off right, other times it doesn’t. The common theme here is that it can become a struggle. I’ve come to realize that if there was no struggle, what’s the sense of doing it? How will I learn? We learn from our mistakes, right? Struggle is commonplace in education. We all experience it, so we must all have some interest in the topic. We see it in our classrooms quite a bit, with students and sometimes with ourselves. You might just see it in the everyday world as well. Just the other day I witnessed what I feel is a common form of struggle. I’m not saying that this happens all the time, but I have seen it on more than one occasion. And, I am quite sure that I’m not the only person that has experienced it, but it made me think about how we sometimes make things easy on our students and they don’t get the learning. Take a look and see if this sounds familiar to you. I was placing my order at a fast-food restaurant when this transaction/conversation took place. Me: Hands cashier a ten dollar bill. Cashier: Punches ten dollar payment into the register. This just left me cringing inside. I wondered why this conversation was even happening. Why do people struggle with something that seems so practical? Has this employee ever been pushed to think outside the box? Have they only experienced surface level thinking? Were they part of an educational system that never allowed deeper thinking? Have they ever been challenged? Will they learn from this struggle or will the same thing happen with later ? Challenging students to dig deeper can sometimes be difficult because we want our students to be successful. If the challenge becomes too difficult do they give up and question future challenges? We’re taught to learn from our mistakes, but not everyone enjoys taking this direction. We sometimes reach the barrier of, if we challenge too much, do our students just give up? It’s a tight line that we walk. In Faster Isn’t Smarter, Seeley references a study completed by Jim Stigler and Jim Hiebert in The Teaching Gap where they mention that “when American teachers choose mathematically complex tasks, their teaching approach tended to remove the complexity and reduce the difficulty of the tasks.” It appears that maybe we’re “spoon feeding” our students so that the struggle diminishes. There comes a time when we need to stop showing our students how to solve a problem and allow them the opportunity to figure it out on their own. Maybe we just need to offer more challenges. When we assign a task, how many times have we told a student how to do the problem or task? Are we teaching them that they will always need guidance whenever they are posed a problem? Are we babying them? There comes a point where our students need to start learning things on their own. Students need to struggle sometimes to figure things out and they need to learn from their mistakes. However, if we continue to do things for them they will be those same cashiers that void out their transactions. Seeley explains this concept as “constructive struggling- the value of challenging our students.” When we pose problems or tasks to our students, we need to allow a struggle- we even need to accept failure. When teachers continue to supply information, and even do the tasks for their students, they seem to be doing more harm than good. This reminds me of the eight Standards for Mathematical Practice that we were introduced to several years back. The initial standard (MP1) “Make sense of problems and persevere in solving them” really stands out when you reference “constructive struggling”. When we’re supplying students with the necessary formulas or a step-by-step method, are they really learning anything? They might be getting their answer correct because we guided them, BUT are they really absorbing their learning? So you ask, what exactly is “Constructive struggling”? Seeley identifies Constructive Struggling as……. -when students are given engaging yet challenging problems. -when demanding, possibly time-consuming problems will likely provide more learning value than several shorter but more obvious problems. -when presenting students with problems that call for more than a superficial application of rote procedure. -when guiding questions are presented in a way that stops short of telling students everything they need to know to solve a problem. “As students engage in the constructive struggling needed for some of these problems, they learn through perseverance, in-depth analysis, and critical thinking are valued in mathematics just as much as quick recall, direct skill application, and instant intuition”, Seeley continues. Mathematics is hard, as are other content areas. Sometimes students need to struggle to figure things out, especially when things are complex. Maybe the next time any of us are in that fast-food line we should take a minute and explain to that cashier how to problem solve. As I began to think about my blog post this week, I thought I may want to refocus on the “why.” Why are we in education? Why are we teachers/coaches/interventionists/administrators? And then I started to do my own reflecting. What was my “why” when I started out as a teacher? How has that evolved throughout the last 14 years? I started to think about how my own teaching career has had so many ups and downs. How there were days I could take on the world and felt that I could teach anyone anything, and other days I wondered if I was going to be able to reach one kid in my room. So where (except the inner workings of my brain) am I going with this blog post? 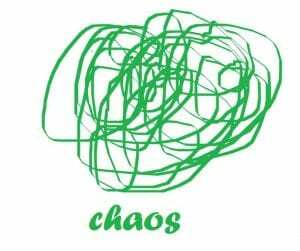 Innovation, change, growth, personalization, and teaching can often times look like chaos. It is hard to tell where things begin and end, just like the line in the scribble above. It is hard to figure out if we are moving forward or just looping around again. How do we move from the chaotic scribble, to a loopy line, to a solid direction? For me, it took a process. I found comfort in the midst of uncertainty by jumping into something called the design thinking process. I was first exposed to this structure at the Learning Forward Conference in 2017. While the session in December sparked my interest, it wasn’t until my life was thrust back into a mode of chaos that I decided to really give design thinking a try. At the end of last school year, I was in a cycle where we were focusing on project based learning. I dove into the book Launch: Using Design Thinking to Boost Creativity and Bring Out the Maker in Every Student to help me coach but at the same time I began the design thinking process for my own life. I quickly clung to the fact that while things were messy at the moment, the framework I was reading about and engaging in gave me an opportunity to know what step I was in the process of and give me direction to head toward. It granted me the permission to allow the beginning to be chaotic because I was taking productive steps to figure out how to come to my solution. Design thinking is a structure that has been used for years. John Spencer and A.J. 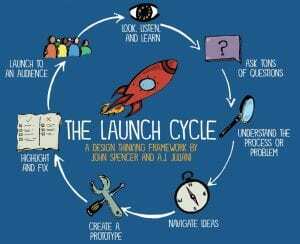 Juliani took this idea, which is prevalent in the business world, and shifted the focus to how we can use this process with our students in the classroom in Launch: Using Design Thinking to Boost Creativity and Bring Out the Maker in Every Student. Teachers are guided in the book to help students move through seven phases. These phases create structure in a messy process of creation for students, teachers, or anyone trying to solve a problem or innovate. Phase 1: Look, listen and learn=Empathize It is all about taking the time to step into someone else’s shoes and begin to really view the issue from their perspective or multiple perspectives. Phase 2: Ask lots of questions=Empathize Students work on developing and asking those tough questions that elicit productive answers. This is a great time as a teacher to get into the world of QFT . Phase 3: Understand the process or problem=Define After viewing a problem/situation from a variety of angles it is time to figure out what is the real issue or problem that needs to be solved. Phase 4: Navigate ideas=Ideate This is where true creativity can flow and students come up with all the possible solutions that they can. During this stage there is no such thing as a bad option. By the end of this stage you want students to gain a focus and select one or combine a few ideas to get moving on. Phase 5: Create=Prototyping This is the time to get hands on and actually start working on making their ideas from the phase before a reality. Phase 6: Highlight and revise=Test We learn best through failure and this is the place where students acknowledge those failures and figure out how to grow from them. Phases 5 and 6 may go back and forth for a while until the student has a solution that they are ready to move forward with. Phase 7: Launch Have students present, share, send, etc. their work to an authentic audience for their problem. Allow this process to move outside the walls of your classroom and make an impact on the world. Personalized learning can seem chaotic when you think only big picture. The Launch Cycle can help you and students find a way to structure the process of personalization with an understanding of steps to take as you/they move forward. This can ease that discomfort that can come with change, innovation, and growth. Back to where design thinking led me… I started my own educational consulting company this summer. I took the process step by step until I was able to launch my idea out into the “real world.” Now my question is where will this thinking take me next? Or maybe more important, where will you let this process take you and your students? What a celebration that 35 Kaneland Staff members took time to experience our first district wide Twitter chat! Kudos to KST with 15 contributing staff members! We had and incredible span of participants from experienced tweeters that have led their own Twitter chats to an individual who tweeted for the very first time. Through this initial conversation, staff members shared topic suggestions related to personalized learning as well as scheduling options that will work best for them. 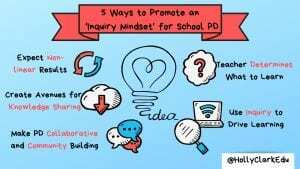 This idea evolved from the #20QPL chat that Nancy and Natalie hosted last spring. In that chat Kaneland participants had conversations with educators across several states. When we reflected on this process, we considered how we really wanted to be having these conversations with our Kaneland colleagues. That is not an easy task when our school district spans over 140 square miles. There are so many questions to ask, answer and ponder. Please consider this an opportunity for us to strengthen our understanding of personalized learning and support one another as we experience this journey together. We will sort through all of the information provided from our launch chat and develop a series of chats that will allow all of you to connect and collaborate to grow your understanding and application of personalized learning. We will post topics, as well as questions, ahead of time so that you can consider which chats are suitable for you. With so many new to Twitter Chats, be on the lookout for a Lunch and Learn opportunity regarding the use of Tweetdeck, hosted by your Instructional Coaches. Tweetdeck makes participating in a Twitter Chat so much easier. If you prefer to be an independent learner, here is a brief tutorial. Please don’t hesitate to reach out to a coach for technical support! Still on the Fence? Why Twitter? Twitter is one of the many social media options for people to reach out to friends, family, colleagues, and beyond. I often hear people say they don’t have time for another distraction or don’t see the value in Twitter. 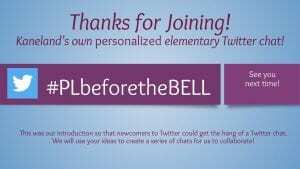 However, Twitter offers opportunities to explore outside of our classroom, school, district, state, and even country. I admit, when I created my account 5 years ago, I needed some real guidance. I started following people, but really didn’t know what to do, so I set it aside and didn’t really come back to it for about 6 months. It took me a while to figure out who to follow and how to make it useful, but once I did, I was astounded at the depth of learning that I have been able to experience on my own terms. It was through participating in Twitter Chats that I was able to discover other educators outside of my Kaneland network, which in return, helped me bring more back to my Kaneland network of educators. Twitter is what you make of it. It is not about keeping up with others or feeling left out It is about connecting with others, finding more colleagues who are like minded, and validating the hard work you do everyday. Here are a few suggestions that have made Twitter more effective for me. Allow your activity on Twitter to ebb and flow with your mood and activity level. There is no pressure to be constantly checking on what is out there. Keep your teacher account professional so that when you are on Twitter,you are in the frame of mind to connect with teachers. On the flipside, other social media accounts, keep strictly personal. This helps create that work life balance by not intermingling the two. Some people even prefer to have two separate accounts on Twitter, Instagram or Facebook so that they can keep their focus separate. It is okay to just follow others and digest what is there. You don’t have to post often to benefit from an educational Twitter account. There are several educational hashtags that you can search to see what people are sharing. Linked below are some recommended Twitter Chats for educators, but you can simple search the hashtag at any time and it is as if you had been there. It is almost like eavesdropping, but no one cares! What Other Chats can I Explore? If you are looking beyond Kaneland, participating in a chat with colleagues at your grade level or who have a similar interest could be extremely valuable. Here is a list from Scholastic of some recommended chats for educators. If you have participated in a chat that you would highly recommend to your peers, please comment on this blog….and you might just find a delicious thank you heading your way! Sharing is sweet!